On the night of 11 June 1957, Hughie Gallacher climbed an embankment close to his home in Gateshead, he said ‘sorry’ to two young trainspotters who were standing close by and stepped in front of the Edinburgh – York express train near a place called Dead Man’s Crossing. At 54 years old, life was over for the ‘King of Tyneside’. Whilst his football career was full of wonderful highs, life off the pitch for the Scot was not so easy. A failed marriage followed by a costly divorce, then the death of his second wife all dealt blows to the tiny striker. He rode them, but a charge that he ill-treated his son finally proved too much for the proud Scot, and he took his own life. Whilst playing for a junior side and working in the local Hattonrig Pit, the then 16-year-old went to watch Bellshill play St Mirren juniors. They were were a player short, and he was given the chance to play, scoring his team’s goal in a 1-1 draw. Hughie would later say that throughout his career, which spanned 18 years, he would earn £6 per week in summer and £8 per week in winter. The money he was offered was huge for a former miner. He jumped at it and soon decided to marry Annie McIlvaney a girl he had met whilst working at the mining company. They wed despite objections from both sets of parents and lasted barely a year before separating. During the time they were together they had a son, who sadly died before his first birthday. Soon after, a daughter was born and they tried again to live together. This time it lasted until 1923 when they parted permanently. They were finally divorced seven years later after Annie had repeatedly refused requests for the marriage to be brought to an end, with Hughie ordered to pay £4,000, an amount that bankrupted him. Whilst at Queen of the South he contracted double pneumonia and was on the danger list in a Dumfries hospital. During his recovery he was visited by the directors from Airdrieonians who offered him the chance of first division football and £9 per week. He quickly settled into his new surroundings and broke into the Scottish national team in the 1923-24 season, one in which he scored 33 goals in 34 games for his club and helped them win the Scottish Cup. Another 30+ goal season followed and Hughie started attracting the attention of the top English clubs. When it was reported that Airdrie might sell him there were demonstrations by fans but in November 1925, Newcastle made an offer (£6,500) that the Lanarkshire club couldn’t refuse and he moved to England. His debut for his new club came in December 1925 amid reservations that he was too small from Newcastle fans. The fears were dispelled when he scored two and made one in his first start, immediately becoming the idol of the Geordie fans. Perhaps the thing that made him stand out, and made it possible for him to take on, and get the better of those defenders who were almost a foot taller was that there was something of the ‘street fighter’ in his playing style. He would think nothing of transgressing the rules if it gave him an advantage. Shouting ‘leave’ to make opponents miss a cross, standing on the opposing goalkeeper’s foot at corners, he played the game with a chip on his shoulder. The legendary goalkeeper Frank Swift, who called him ‘the greatest centre-forward I ever saw’ also said; ‘He had more tricks than a bucketful of monkeys’. Disciplinary problems affected his career. He regularly fell out with referees over the lack of protection he received, once pushing one into a bath in an incident that earned him a two-month ban. But this aggressive side to his nature was one of the many things that stood out in his game and the whole package made him the ultimate centre forward. His legend continued to grow. Controversially, he was made captain of Newcastle. Some felt he was too young for the role, while it was also going against the norm for a centre forward to be made skipper. Gallacher proved the doubters wrong, scoring 36 goals in 38 games in the 1926-27 season and leading Newcastle to the 1st Division title. He also started the legend of the ‘Great Newcastle number 9’ which was carried on from Jackie Milburn through to Alan Shearer. 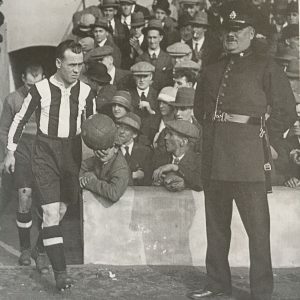 Whilst at St James’s Park, Gallacher went on a close-season tour with the club, visiting Italy, Czechoslovakia, Austria and Hungary. He recalled it as a real eye-opener on foreign tactics, and fans. “I had some tough times in the Football League”, he would later recall, “But compared with those foreign matches those League games were like playing with a bunch of schoolboys. ”After our first match in Italy the lads could hardly limp off the pitch. Winger Tom Lang showed me the marks on his neck where he had been bitten. ”We thought that was the end of our trouble. In fact, it had only just begun. A mob gathered round our coach, and stones and bottles whizzed through the window”. Along with 143 goals in 174 games on Tyneside, Hughie also became well known around town, known for his dapper dress-sense and often seen out in bars and pubs, although he always kept himself in top physical condition. Whilst visiting one of his regular haunts, he met and fell for Hannah Anderson, the 17-year-old daughter of the landlord. Young Hannah’s family was against the relationship and Gallacher was bound over to keep the peace in an effort to keep him away from her. But they continued seeing each other and would eventually marry in London and have three sons. During his Newcastle spell, one match at Wembley saw the Gallacher football legend, along with that of his old friend Alex James and others, cemented. In 1928 Scotland travelled to Wembley to play the mighty England. 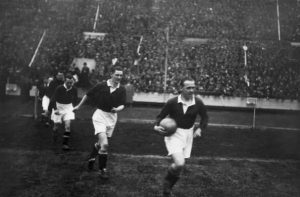 The Scots were coming off disappointing results against Wales and Ireland, but, of course, the game against the ‘Auld Enemy’ was different. Gallacher was picked for the match despite having been out for two months. The Scottish forward line was diminutive to say the least. Alex Jackson was the tallest at a mere 5ft 7in. As with a number of incidents in Gallacher’s life there is some dispute about his departure from Newcastle. Some claim that he asked the club to sell him to alleviate financial problems brought about by his divorce. 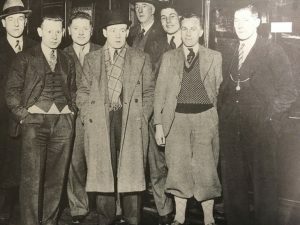 Gallacher claimed that he was sold behind his back, saying later; “Why Newcastle wanted to let me go I never found out.” Resting in Bellshill after an international in France he was visited by Chelsea chairman Claude Kirby who persuaded him to become the London club’s latest glamour signing for £10,000. Newcastle got 143 goals in 174 appearances for their £6,500 investment, and made £3,500 profit when selling him. Chelsea were known at the time for signing big-name stars to sell tickets but rarely produced a side strong enough to challenge for major honours. Gallacher was part of a £25,000 spending spree by the club that also brought fellow Scots the aforementioned Jackson and Alec Cheyne to Stamford Bridge. His second game was at his former club and over 68,000 spectators attended with another 10,000 reportedly locked outside St James’ Park. In just over four seasons at Stamford Bridge, Hughie became a huge favourite with the London fans. He scored 72 goals, finishing top scorer in each of his campaigns. Whilst undoubtedly adding to gates, he failed to bring trophies to the club who continued to build on their reputation of being maddeningly inconsistent. The closest he came to glory during his time with the club was in 1932 when they reached the FA Cup semi-Final only to be beaten 2-1 – by Newcastle! In 1934, at the age of 32, he moved to Derby County, signed to replace the injured Jack Bowers and he helped the club to second place in the Championship in the 1935-36 season with 38 goals. Whilst at County he played in the same team as Jack Barker, a man he would later claim was the best defender he remembers. Barker, says Gallacher, was ‘A masterful player, strong, two-footed and yet constructive’. After it initially looked like he might return to the North-East with Gateshead keen on his signature, Gallacher instead dropped down to the 3rd tier joining Notts County of the 3rd Division (South). As ever, attendances jumped upon his arrival and another fine season brought 32 goals in 45 games with his team finishing runners-up, just missing out on promotion, and costing Hughie a big pay day. A local businessman had offered Gallacher £800 if he led County to promotion and they needed three points from the last two matches to clinch a place in Division Two. But a late goal led to defeat by Brighton and ended their chances. As Gallacher later recalled; “Over came a corner, up went the attacker, a thump and the ball was in the back of the net. ”I stood, horrified, looking at the ball in the net, hardly able to realise that my £800 had gone in a matter of seconds”. Next, former Newcastle teammate Charles Spencer took him to Grimsby Town (at that time in the top flight) where he helped the team avoid relegation before a ‘dressing room disagreement’ brought about another switch. This time it was a return to his spiritual home in the North East, signing for Gateshead. 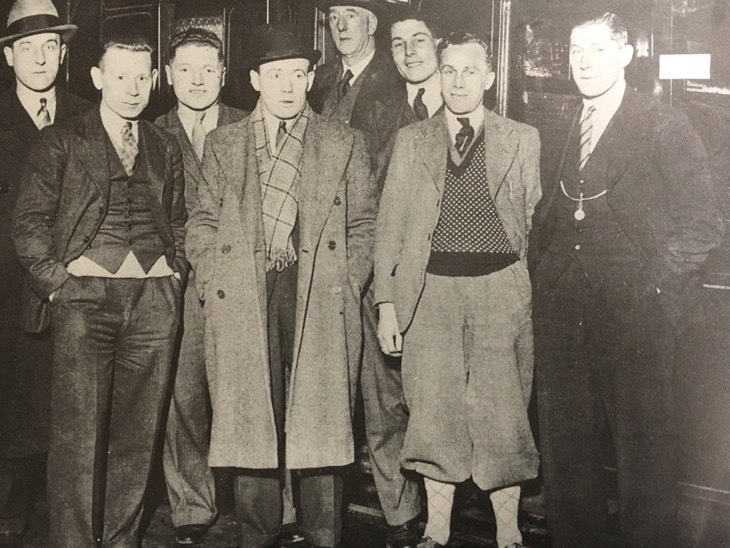 Hughie (4th left) and his Chelsea teammates enjoy a night out. Upon returning to his beloved North East, Gallacher said; “It’s grand to be back on Tyneside.” Crowds at Redheugh Park soared to over 20,000 as fans flocked to see the return of the ‘local hero’ and he didn’t disappoint, still banging goals in regularly at the age of 36. In one game Gateshead took on Rotherham United who had a promising young centre-forward named Walter Ardron. “Sixteen scouts came to watch him play,” Hughie would later recall. “And it was a highly successful day with five goals going to the centre-forward. ”But it was Gateshead’s Hughie Gallacher who shot them all”. With war clouds looming, Gallacher decided it was time to hang up his boots and he retired with a career total of 463 goals in 624 games (he was never happy if he didn’t score in a game, even if his team won) and continued to live in the North East, appearing regularly in charity games. Jackie Milburn said; “I only once played with Hughie and that was in a charity match when he was 52 years of age. He lived, it seemed, a happy life in retirement. Upon returning to the area, Hughie had said; “My heart has been here ever since I left United. I intend to spend the rest of my life with my adopted folk in Gateshead”. And he did. Treated with reverence by all, it appeared that he would live a long and contented retirement in his adopted home. Then, in 1957 the local branch of the NSPCC made a complaint after Hughie’s 14-year-old son Matthew was injured at home. The son was taken into care and his father was charged with assault. Accounts of what happened in the build-up to Hughie’s sad end are sketchy. It is known that wife Hannah had died a few years earlier and that, with no savings from his football career (from which he earned a reported £10,000 in total), he took a number of menial jobs to keep the family together. Those close to the Gallachers insist that he was a good father and the ‘abuse’ incident was a trivial and isolated matter. He had asked Matthew a number of times to do something and been ignored so he threw a plastic ashtray at him to get his attention. The ashtray glanced off the boys head and drew blood. Older son Hughie junior came home and, seeing the blood on his brother’s face took him to clean him up. A neighbour got involved and asked Hughie junior if he wanted the police called. In what he has since admitted was a mistake he said ‘yes’. Hughie was charged and the accusation of abuse, and that people would think him capable of it, weighed heavily on him. His depression was deepened by Hughie junior telling him he never wanted to see him again, a comment the older son later admitted he regretted making. Always a proud man, Hughie took to walking the streets as the trial date drew near, telling those he spoke to that it was; “no good fighting this thing. My life is finished”. On June 11 he left a note addressed to the Gateshead Coroner, apologising for the incident and saying he would never be able to forgive himself, left home and, ignoring the greetings of others, headed toward the railway line. For a man adored by so many, it would seem that the mere thought that he could be considered by those same people as capable of harming one of his children proved too difficult to live with. So, Hughie Gallacher said ‘sorry’ and took his life. For those who had idolised him during his playing days it would seem that an apology would never be necessary.